The 11th of July was the first time this year (and as it turned out later the only time this year) that we had a so-called "Triple-P" evening. David Lane, pianist and composer, gave a piano recital, while the international rewarded poetess Maro Vouduroglou-Vlachaki read some of her poems. 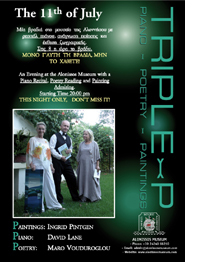 In the museum were paintings of Ingrid Pintgen to illustrate everything. The Glass Bottom boat brought in a lot of people from Skopelos (almost 80!!) who specially came over to attend this Tripple-P event for a special price of 10 Euro only. For the people who were not there and for those who were, we give here a short impression of that night.